Old roads and new trails in and around Hunterdon County’s Jugtown Mountain offer scenic options for fall explorers as they wander through historic districts, old hamlets, wooded roads, environmental preserves and county parks. The more you look, the more you see! Here are the details. 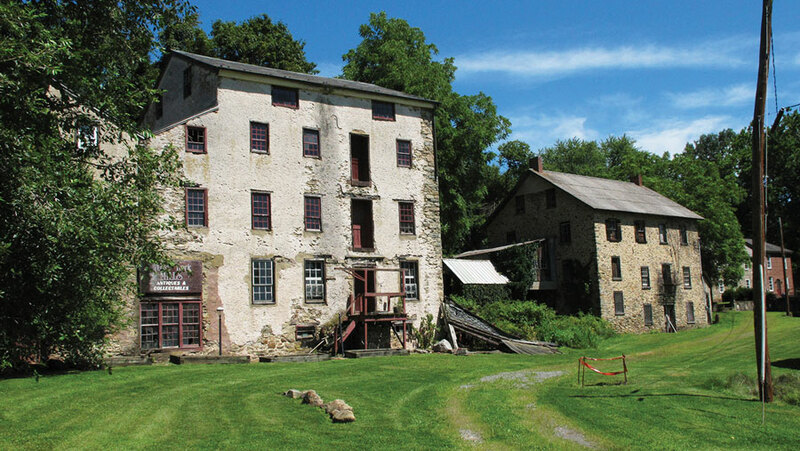 The old mill complex in Little York once housed an oil mill, distillery, creamery and cheese manufactory. Exit 12 on Interstate 78, known locally as “the Perryville exit”, sits atop a layer of old roads: the c.1740 “Easton-Brunswick turnpike”, the c.1812 “New Jersey turnpike”, and old U.S. Route 22. For more than 250 years this corridor has been the main transportation route between Pennsylvania and eastern New Jersey, and you will no doubt notice the preponderance of timeworn taverns along our itinerary. 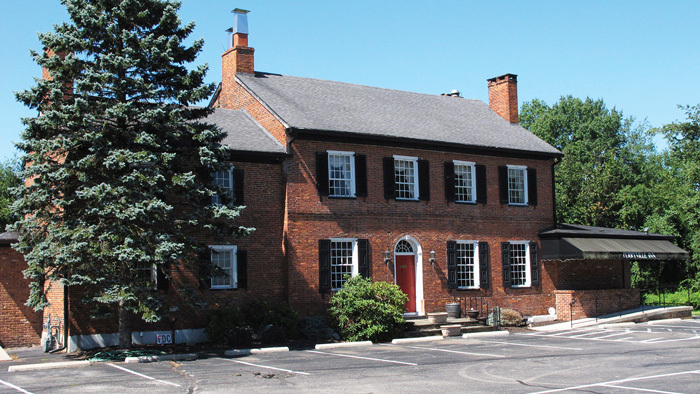 First, the elegant “Brick Tavern”, later named the Perryville Inn, was built here in 1813. During construction of the inn, a mounted courier announced Admiral Perry’s victory over the British on Lake Erie. With patriotic fervor and a dash of whiskey, the proprietor anointed his new tavern “Perryville”. The old tavern was moved in 1960 to its present location a few hundred yards south of Exit 12, to make way for the interstate. West of Exit 12, along Route 173, the central section of the stone farmhouse once owned by Dr. Blane, a well-known and dedicated physician of the 1800s, is claimed to have been built in 1685, making it the oldest intact structure in this township. It eventually became an upscale restaurant, the former Coach ‘n Paddock, currently called “The Farmhouse at the Grand Colonial”. And a bit down the road is the very modern Hunterdon Hills Playhouse, known for fine dinner theatre. A short distance north of Exit 12, on Charlestown Road, the Clinton Wildlife Management Area offers unmarked trails that traverse ranges of varied habitat, providing opportunity to spot a wide variety of bird life including Bald Eagles and other raptors, waterfowl, shore birds, and song birds. Hunters will enjoy the WMA’s shotgun, rifle, and bow ranges, plus its dog training area. Above: Van Syckels Tavern was a hub of activity in the early 19th century. Below: The Perryville Inn was moved enmass to make way for Interstate 78 construction in 1969. 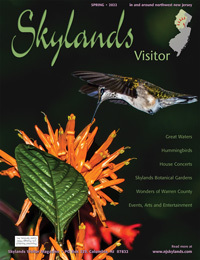 The 150-mile-long Highlands Trail, blazed with teal-colored diamonds, and which connects the Hudson River at Storm King Mountain with the Delaware River at Riegelsville, passes through the Clinton WMA. A work in progress, the project combines recently blazed trails with pre-existing footpaths and road walking. The Trail meets and follows Charlestown Road at Van Syckel’s Corner where another tavern, now a private residence, was built with fieldstone in 1763 by Irish immigrant David Reynolds. He was eventually led astray by counterfeiting, for which he was hanged. Aaron Van Syckel purchased the tavern in 1795 and built a store nearby, providing food, drink, and companionship for travelers and neighbors for decades, until the store and tavern closed in the 1850s. Nearly a mile north on Charlestown Road at the intersection with Norton Church Road, the small hamlet of Norton owed its formation to nearby iron mining during the 1800s. The vintage Methodist Episcopal church here still lends a certain grandeur to the place. The Highlands Trail climbs Jugtown Mountain, following Norton Church Road and then Mountain View Road, which bisects the 216-acre Tower Hill Reserve, named for the tall power line towers traversing the mountaintop. Hikers, mountain bikers, and cross-country skiers may use the Reserve’s network of easy unmarked trails that skirt meadows, some forests, and wetlands. The meadows, managed for grassland birds and mowed only after the nesting season has passed, host wildflowers and butterflies, bluebirds, woodcocks, orioles, and other birds. Sign of beavers may be found in the marshy wetland areas, and there is a vista at the Reserve’s eastern edge. A nicely restored roadside springhouse is the only reminder of the large farm that once operated here. Nearby stood a large 1840s farmhouse, recently demolished due to maintenance costs, in which Thomas Edison’s “storekeeper” once lived. Just beyond a small parking area, the Highlands Trail leaves the road as it continues through the Reserve, onward to Jugtown Mountain Preserve a mile away. By car, turn left on Mine Road at the end of Mountainview Road, following it to a narrow, nearly hidden, gravel lane. You can access the Highlands Trail here before it descends down Jugtown Mountain to West Portal. The 262-acre Preserve’s trails lead past remains of the Swayze Mine—old foundations, pits, tailings, and water-filled workings. Watch your step! About 1868, the mine employed over 300 men, mostly immigrants, who removed up to 16,000 tons of high-quality iron ore annually before the mine closed in 1889. The mine reopened for four years near the beginning of World War II when nearly 250 men removed an estimated 800 tons of ore daily, much of which was used for the production of armor plate. At the end of Mine Road, turn right onto Route 173 as it heads down the mountain. 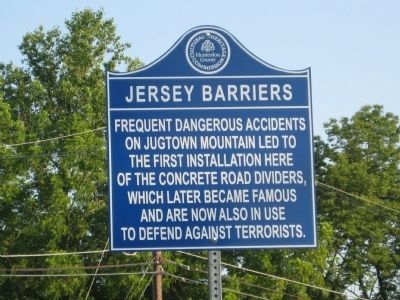 “Jersey Barriers”, those familiar concrete highway dividers still used today, were first implemented in New Jersey on this steep and dangerous roadway. Just before reaching the hamlet of West Portal, a huge boulder on the mountainside to the right, named Hannah’s Rock, is claimed to be the largest non-covered boulder in New Jersey. Legend holds that during the Revolution two local craftsmen plied their trades from a cave located under the rock. Near the bottom of the hill, a sharp left turn onto Tunnel Road rejoins the Highlands Trail as it passes through the quaint hamlet of West Portal, its name reflecting the western entrance to the nearby Musconetcong railroad tunnels. The West End Iron Company, operators of the Swayze and Turkey Hill Mines, were the area’s largest employer, supporting various small town businesses. Some accounts attribute West Portal’s earlier name, Jug Town, to the 20th century stills alleged to have existed near there during Prohibition. But, the name has appeared in newspapers since at least 1810, so it is more likely traceable to the presence of its 1761 “jug tavern”, a colloquially derisive term for a low class establishment. 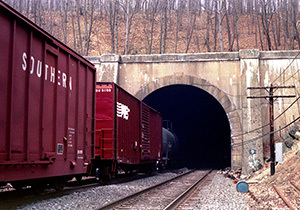 The present day Musconetcong Tunnel, still used by Norfolk Southern railroad, was blasted through Musconetcong Mountain in the 1920s to replace the neighboring 1870s tunnel which was then too narrow to handle newer, wider rail cars. A deep railroad cut to the right of Tunnel Road suddenly disappears as the road turns sharply over it. Here lies the entrance to the first Musconetcong Tunnel, bored through the mountain toward Pattenburg in the mid-1870s for the Easton-Amboy railroad. This tunnel was abandoned in the mid-1920s when a second, bigger tunnel was bored alongside it to accommodate larger railroad rolling stock. The Norfolk-Southern railroad still uses this tunnel today. Shortly after Tunnel Road passes under the I-78 overpass, the Highlands Trail leaves the road, climbing the hill to the right towards New Jersey Audubon Society’s Deer Path Sanctuary and the adjacent Turkey Hill Preserve. Only hiking is permitted here. The Trail and a few short spur trails lend the opportunity to observe birds and other wildlife. The old Turkey Hill mines are on the other side of the hill. When Tunnel Road ends at Route 579, take a left and an immediate right onto Sweet Hollow Road as it heads toward the hamlet of Little York. This narrow wooded road passes through scattered sections of Sweet Hollow Preserve, again meeting the Highlands Trail, although there is little if any trailhead parking. The road continues through a deep wooded hollow dotted with quaint, picturesque cottages. Depending on the state of ongoing bridge repairs, reaching Little York may involve a detour that follows the scenic Myler, Hawk Schoolhouse, and Ellis Roads through open countryside with some beautiful expansive views. 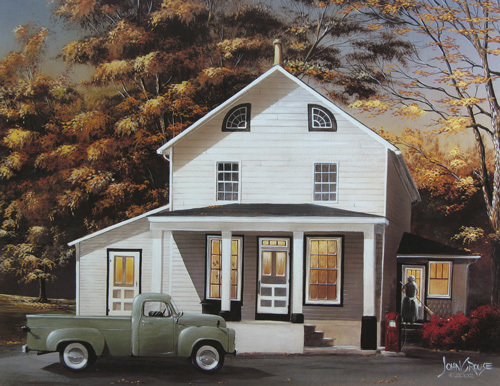 Artist John Crouse, a native Little Yorker, depicted the former Alice’s General Store on Sweet Hollow Road as it may have appeared circa 1960. Little York straddles a small stream, and an impressive old stone mill complex stands in the northern end of the village. Nearby, the Little York Inn, located amidst the hamlet’s vintage buildings, still supplies food and drink to today’s neighbors and travelers. An old tradition claims that the village was once known as “Pokano” because the town’s distillery foreman had the habit of striking troublesome workers on their noses with a hot poker. A half-mile south of Little York, on CR 631, is the 311-acre Schick Reserve, once the site of a large dairy farm. The Alexandria Equestrian Society has constructed eight miles of trails that are open to hunting, horseback riding, wildlife spotting, hiking, and cross-country skiing. Horse trailers are easily accommodated at the Reserve’s large parking area on CR 631. Vastly different than the hilly, wooded roads traversed thus far, the area opens up into a wide expanse of fields, some farmed, some developed for housing, all picturesque. In Hunterdon’s early years this wide tableland, estimated at the time to cover fifty square miles, was known as “the Barrens”, named for it’s poor soil condition. Beyond the Schick Reserve, a left on Hickory Corner Road leads to its end at Route 579, known in the 1700s as “the King’s Highway”. The original Hickory tavern, a log house, was built on the opposite side of the road about 1769, and was replaced about 1800 by the large frame house we see today. Standing on the edge of two watersheds, rainfall on the shed roof drained from one side into the Delaware and the other into the Raritan. Its patrons consisted of travelers and teamsters carting iron ore between Bloomsbury and Pittstown. “Liver Eating” Johnson (John Garrison), later known as John Johnston, was born near here around 1830. The 1972 movie “Jeremiah Johnson”, starring Robert Redford, was based on his life. 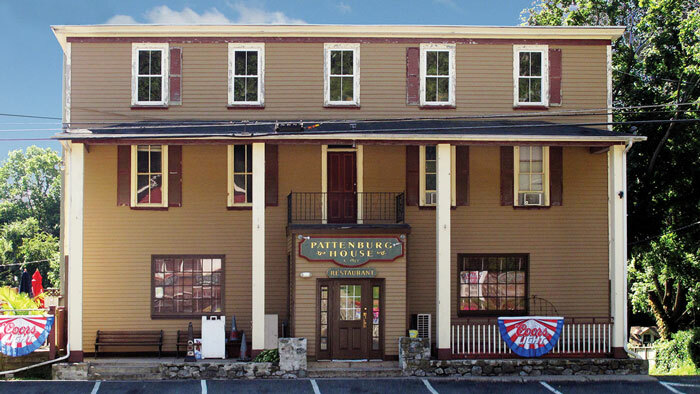 The Pattenburg House is one of Hunterdon’s oldest active taverns. Turn left onto Route 579, then turn right onto CR 614, heading toward the village of Pattenburg, allegedly named after a “patent”, or license, once held by its local rye whiskey distillery. Once called “Calvin’s Mills”, the town supported a school as early as 1804. Spurred by the coming of the Lehigh Valley Railroad in the 1870s, Pattenburg once held a passenger station and freight house, as well as a few stores, a basket factory, hotel, church, and dwellings. The railroad built and operated Bellewood Park here from 1904 to 1916, an amusement park with landscaped grounds, dining pavilion, concessions and rides, including Hunterdon’s first and only roller coaster. The Pattenburg House, just beyond the railroad overpass, is one of the county’s oldest active taverns, serving visitors since the railroad heyday. Just before the railroad overpass, turn right onto Main Street, which leads past many of Pattenburg’s vintage homes, then through farmland to Baptist Church Road. During the 1870s, an ethnic conflict known as the “Pattenburg Riot” involved hundreds of men employed to cut the new tunnel through nearby Musconetcong Mountain. When a member of one group was found murdered near the tunnel, his fellow workers killed three men near their shanties on Mrs. Carter’s farm a mile outside of town along this road. 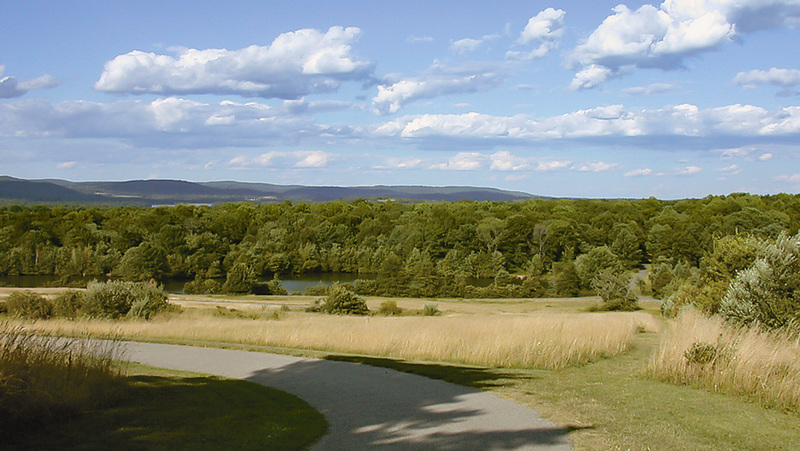 Overlooking a broad vista, a network of easy trails winds through a chain of ponds at Hoffman Park. Turn right on Baptist Church Road and you’ll approach the 354-acre Hoffman Park, with scenic views that encompass fields, woods, and the Spruce Run Reservoir in the distance. A network of easy trails, some paved, lead hikers, bikers, runners, and cross-country skiers along meadows, hardwood forests, and various ponds, some suitable for fishing. Hunting is allowed by special permit. 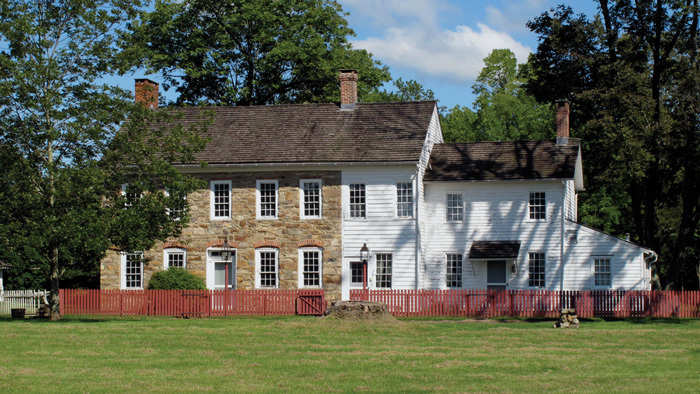 In the late 1930s Joyce and Albert Hoffman, co-owners of a successful beverage company, purchased a c.1875 farmstead from actress Ione Hutaine, whose Jutland Summer Theatre, the forerunner of the Hunterdon Hills Playhouse, was located just south of the park near today’s Country Acres Road. It was destroyed by fire in 1946. 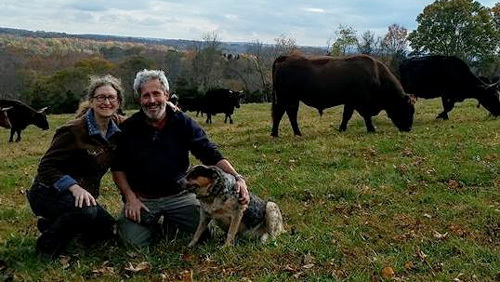 After adding other tracts to their estate, the Hoffmans used part of their land to grow grain and hay while renting their pastures to local farmers. Cattle fencing was installed in the 1940s, along with dozens of ponds which acted as irrigation sources and erosion control. Lanes, graveled or paved later, are also now part of the park’s trail system. The estate became Hoffman Park in 1999. 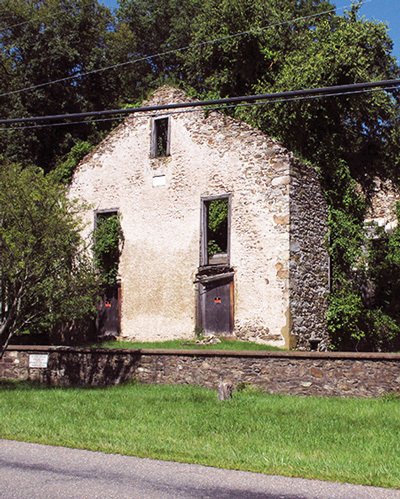 These preserved and stabilized ruins once served the congregation of the Bethlehem Baptist Church, built in 1837 and abandoned in 1906. From the park entrance, about a mile to the right is the stone ruins of the Bethlehem Baptist Church, the road’s namesake. Turning left, Baptist Church Road leads back to Route 579, on which a left turn leads a short distance to Mechlin’s Corner and the old Mechlin Tavern, now a private home. One of the township’s oldest extant buildings, the tavern probably existed by 1752. While the Perryville tavern served a “higher class” clientele, its patrons were mainly “blue collar” workers and, like the Hickory tavern farther up the King’s Highway, some were teamsters carting iron from Bloomsbury to Pittstown. The first Mechling bought the tavern in 1810, and the property remained in the family until 1934. Just south of Mechlin’s tavern, “Mt. Salem”, neither town nor hamlet, takes its name from the restored Civil War era Mount Salem ME Church that sits just yards from the old “King’s Highway”. It now serves as the Historical Museum for Alexandria Township. 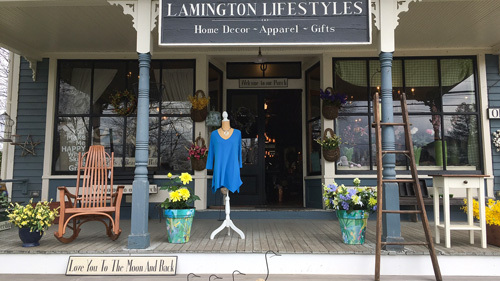 A short distance past the church, turn left onto Cooks Cross Road then take another left onto Finn Road, which meanders through pleasing wooded home sites and open fields before reaching the vintage homes of Jutland, known as Midvale in the 1800s. With the coming of the railroad in the 1870s, the hamlet became an active rural commercial center. The town had a peach exchange, creamery, feed mill, coal & fertilizer store, a general store, and more. The “Battle of Jutland” occurred in 1926, not far from where Main Street crosses over the railroad tracks to become Perryville Road. A nightlong siege and a vicious one-sided gun battle took place when more than a dozen state police fired hundreds of shots at three occupants huddled inside a local farmhouse, killing one of them. The incident was precipitated earlier that evening when the farmers refused access to their livestock by two S.P.C.A. agents investigating an apparently bogus complaint. Perryville Road continues past the “Hensfoot” intersection, so named for its shape, before passing the Perryville Inn just before Exit 12, where we began. Except for some long stints as a farmhouse in the early 1900s, the old inn has served travelers and patrons since 1813. Unfortunately, at the time of this writing, the inn is once again closed. A caveat to those venturing out in fall: hunting is allowed in some of the area’s preserves, so visitors should take proper safety precautions by wearing bright orange outerwear or by limiting visitation to days when hunting is not permitted, generally Sundays. Also, some preserves have no toilet facilities. Check respective websites for these areas for more details. Please email the author with questions or comments.